Yet another propaganda essay masquerading as a scientific paper has been published (SI here) in the journal, Environmental Research Letters. The latest entry, Quantifying the Consensus on Anthropogenic Global Warming in the Scientific Literature, written by a team of activist bloggers led by John Cook of the antithetically named Skeptical Science blog, attempts to further the meme of a 97% consensus of scientific support for a faltering Global Warming movement. There have been a number of posts, for example, here, here and here at Lucia’s Blackboard or this one and that at WUWT which discuss the weak data gathering / data interpretation methodology and the truly incredible spin-one’s-head- around algorithm for generating a value of “97” which conveniently ignores a large proportion of the data. My focus in this post will be to examine some of the other “quantifying” material. Given the virtual absolute absence of available data and statistics in this paper, this will not be that easy a task. The authors have apparently bought into the Climate Science tradition of why should I make the data available if you will only use it to prove me wrong. I should point out that I have spent much of my academic career doing just that and become reasonably adept at recognizing situations where work might be shoddy. This is due to my experiences with consulting on academic research projects, Ph.D. and Master’s theses work as well as outside the university. When interviewing the researchers about their project, I would tell them that I would attempt to find everything that was wrong with their planned research. When it got to the point that this was no longer possible to do, I would be satisfied that the statistical aspects would be adequate for answering the questions that they wished to answer. One of the items that caught my eye was Figure 2b: Percentage of self-rated endorsement, rejection and no position papers. 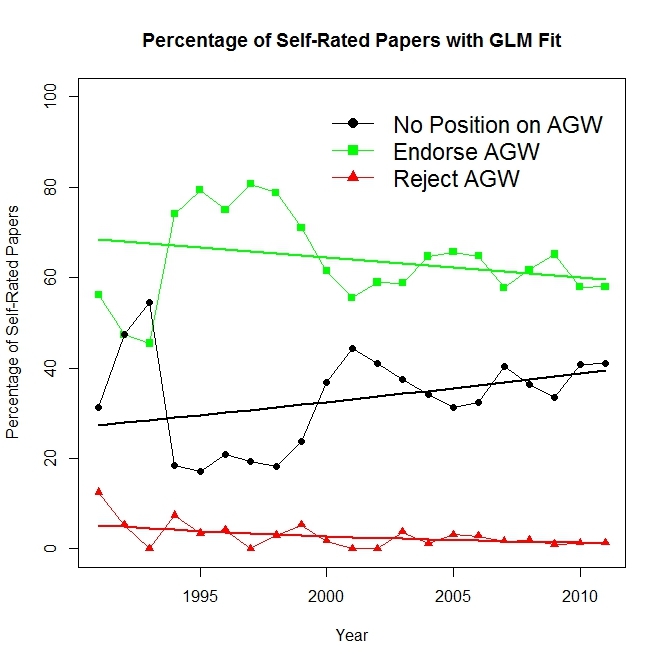 Figure 2(a) shows the level of self-rated endorsement in terms of number of abstracts (the corollary to figure 1(a)) and figure 2(b) shows the percentage of abstracts (the corollary to figure 1(b)). The percentage of self-rated rejection papers decreased (simple linear regression trend -0.25% ±0.18% yr-1, 95% CI, R2 = 0.28; p =0.01, figure 2(b)). The time series of self-rated no position and consensus endorsement papers both show no clear trend over time. Figure 2(a) showed that the number of abstracts each year was increasing at a very high rate. This implied that the variance of the percentages calculated for figure2(b) would change substantially from year to year. Since a “simple linear regression” assumes homoscedasticity (i.e. equal variability) of the data from year to year, this would mean that the early years with very few abstracts would have an inordinately strong influence in the calculation of the parameter estimates as well as possibly distorting the interpretation of the significance of the results. As well, the model for this regression (which for convenience we will do for a probability rather than a percentage) looks like: Pk = α + βTk where Pk is the probability that a paper in year Tk will belong in the category for which the regression is being done (e.g. “rejection papers”). An observation for that year will look like pk = nk / Nk where nk is the count of papers in years k and Nk is the total number of abstracts in that year. One should note that pk is assumed to have a binomial distribution with parameters Nk and Pk. The full model becomes pk = α + βTk + εk where εk is a random variable with mean 0 and variance equal to Pk (1 – Pk ) / Nk . The data needed to create Figure 2(b) was, you guessed it, unavailable, so I digitized the data in the graph using a simple R programme. The large symbols used in the graph were not helpful to the process, but I managed to get what appeared to be a very reasonable replica of the various plots. The replicated plot appears below near the end of the post. The differences of size 20 seem to be much too large to be explained as digitization errors (since a check on Photoshop of my reconstruction and the original graph showed an extremely close matchup of points, so this appears to be something that Mr. Cook could address by providing the “correct” values for the totals he gives in the paper. However it is not the central issue here. The Cook bound for the confidence interval appears that it might have been calculated from a simple 2 times standard error calculation rather than formally using the appropriate t-value – something one should not do in a professional paper. The magnitude of the slope is reduced by about 39% from the inappropriate unweighted regression. I repeated this exercise for each of the other groups for which no results whatsoever were calculated because ostensibly “the time series of self-rated no position and consensus endorsement papers both show no clear trend over time”. One would think that for interest’s sake, such results would at least appear in the SI. Using a more appropriate regression can produce substantial changes in the results. where exp(x) represents the exponential function ex. This particular model is also known as logistic regression. Fitting is done using maximum likelihood techniques and interpretation of the estimated coefficients differs somewhat from the regression case. Unlike linear regression the result is always between 0 and 1 with no negative probabilities. Also, confidence intervals for probabilities are usually not symmetric about the estimated value. You will note that all three of the groups now seem to have statistically significant rates of change with the Endorse group showing a decrease of almost 9 percentage points over the 20 year period. 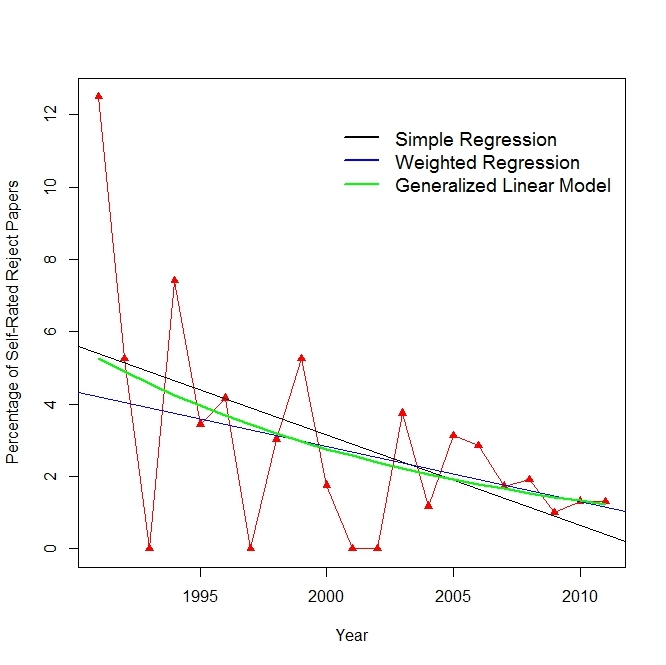 The plot below shows the distribution of the Reject group with associated regression lines and the fitted GLM. Open the script cookpost.R . This entry was written by RomanM, posted on May 24, 2013 at 9:12 AM, filed under Uncategorized and tagged cook. Bookmark the permalink. Follow any comments here with the RSS feed for this post. Both comments and trackbacks are currently closed. It looks like there’s something missing in “I would attempt to everything that was wrong”. Interesting that the Endorse category experienced a period of rapid decrease at about the same time the No Position experienced a rapid increase in percentage. It may be about the same time the whole world realized that global average temperatures were not increasing. The ‘endorse’ category and the ‘no position’ categories are in fact almost perfect mirror images of each other. That shouldn’t be surprising because the three percentages always total 100. The reject group is relatively small so changes in one of the other two categories will induce a comparable change in the third one. Possibly distorting?. It would appear that around 1994 “No Position” holders migrated to “Endorse” in mass exodus almost overnight. Hard to think of any one event or paper that would cause that…? Gotta say, Roman, that anyone who needs that kind of statistical vetting on their project isn’t doing science. Epidemiology, at best. When interviewing the researchers about their project, I would tell them that I would attempt to find everything that was wrong with their planned research. That last paper is in volume 20 of Stat. Sci. which is dedicated to the misuse of statistics. Why not choose out Cook’s paper as exemplifying everything that’s wrong in abusing statistics. Analyze every detail, write it up, and publish it. Doing so will expose Cook’s chicanery, embarrass Environmental Research Letters as inept, and humiliate the University of Western Australia. All good outcomes. You’ve done the work already. Your paper could be a tonic for the field. Please, pretty please, with statistical strawberries strewn through? John Cook does appear to have produced another negative exemplar—an article that illustrates, in detail and along multiple dimensions, how not to conduct, analyze, or eport empirical research in the social sciences. Unfortunately, he’s competing with his own sometime collaborator, Stephan Lewandowsky, for worst in category. how not to to *report* empirical research… I meant to type. Source: Statist. Sci. Volume 20, Number 3 (2005), 231-238. So now if they adopt your criticism and adjust the paper, does that make Cook a denier, under Dana’s new definition. Use of 7 decimal points is kinda crazy. No, I mentioned in the post that I intentionally was not rounding the values. I wanted everyone to see exactly what I was looking at when I was doing the calculations. In fact, when I was doing the digitization of the percentages, it would have been foolish to round the digitized values because the next step was to reconstruct the counts by multiplying these by the known total for each year. The product is then rounded to an integer. Errors in digitizing which produce products whose fractional portion is close to one-half can push the rounded count to the wrong value. I wanted everyone to see exactly what I was looking at when I was doing the calculations. Not to be pedantic, but recall that what is displayed is often only an approximation of the underlying data. With caveats about relevance, language, data type, etc. The main reason your comment caught my eye was that I just happened to be working a little issue w/ the problem of Round(x) not being a linear operator, ie. Round(A) + Round(B) != Round (A + B), Round (mA) != m Round(A). RomanM: I am not sure of what point you are making with regard to my above statement as to why I did not bother to round the output from the calculations. It was what I was looking at whether it was “only an approximation of the underlying data” or not. On the contrary, in the paper, a p-value which I replicated as 0.0147 had been rounded to 0.01 presumably to give it an air of “significance at the .01 level”, something which I thought reflected the mindset of the authors of the paper. Assuming that the papers appeared in peer reviewed journals, is it surprising that self-endorsed AGW continue to head the table? I am only surprised that “no position” is making progress and that any “reject AGW” managed to get published at all. Surely the only statistic worth investigating is the number of papers in each category that have been rejected. These were my thoughts exactly and have been throughout the debates on this paper. It’s like choosing a % of red-haired people and using them to stand for for the entire population. More seriously, in ‘climate science’ only those disposed to endorse AGW have been in a position to research and to publish in the peer reviewed literature for so long, it’s inevitable that more papers will fall into the pro-AGW category; given this, the result is meaningless. the thing I object to is such categorization of papers in the first place. A paper that only looks at say something about volcanos or the MWP does not on its own “refute” the alarmist position, but may be in contradiction to it when placed with other data/studies. I also object to Cook and friends treating the whole thing monolithically, as if it were a simple matter of faith or not. But the climate models and climate itself are immensely complex. On the one hand, I personally am impressed that the models do as well as they do, but on the other hand do not find them remotely useable for turning society upside down since they disagree with each other and with data so much. So the basic classification they do is meaningless to my mind. As a psychological paper, the classification was supposed to be a kind of a Rorschach test for the the authors of the papers. The funny thing is, it’s turned out to be a Rorschach test on Cook et al. RomanM, you should check out a recent post on Skeptical Science. It uses “statistics” to estimate the total number of papers related to global warming and concludes 881 (of 137,000) reject AGW. It’s cringe-worthy. It seems that the author did a McIntyre-quality(TM) audit of a sample of sceptical papers and found that they were seriously micharacterized as either endorsing . He then contacted the authors of those papers and got some excellent analysis. There is an interesting arcticle here that shows confirmation bias in fact it shows more than that. It alleges to reveal the purpose of the paper before the results were compiled. Lots of papers are written with a purpose in mind. I don’t think this shows anything remarkable. It’s not right, but it’s also not surprising.